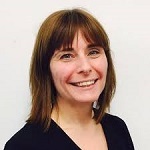 Rebecca Galley is Director of Technology Enhanced Learning (TEL). The TEL unit is responsible for the development and design of the VLE, innovations in learning and teaching technologies, and supports faculty based curriculum teams to use Learning Design and Learning Analytics methodologies to enhance and transform student experience. Rebecca’s background is in professional and management development and training. She has been teaching since 1995 across a number of different educational settings, and has held a number of leadership roles across that time. Her early teaching career was in Adult and Continuing Education and she maintains a commitment to widening access and inclusion. She has a particular interest in how collaborative spaces and places – face-to-face and online – can be used to promote learning, innovation and partnerships in learning and teaching. For more information on her, visit her profile on the OU UK website.